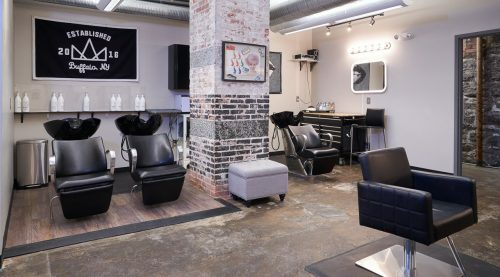 crown is Buffalo’s first salon to eliminate gender-based pricing. They offer a variety of hair and makeup services from their salon in the historic 500 Seneca building, and are actively involved in the community, donating their talents and time to organizations like the PRIDE Center. I was inspired to start my own hair collective after years of watching fellow hair artists be mistreated and worked to the bone, and also saw the need to be the change we wished to see in our industry. There is a real need to break away from the old standard of gender-based pricing in hair studios. We are so proud to have been the first to break the unfortunate “norm” of the salon world. Born and raised in Buffalo, my sister and I chose family over everything else and launched our brand in our hometown. Our Dad had his record promotion business, Could Be Wild, based here. After seeing his work have reach far outside of our region, we knew we could do the same with our brand. It was truly surreal, but was so vital to our growth at the point we advanced into the final 27. Being a small business, we were conservative about starting out with overhead costs and growth. We hit the ground running and have since been able to scale up, doubling our team since opening day. I’d say the proudest moments are those little ones. Being out on the town, seeing our sticker on a car. Hearing that strangers met out in public because they noticed each other wearing our hats. Creating a community of acceptance and inclusivity, when some guests have mentioned in the past that they never felt comfortable in our atmosphere before. In addition to those moments, going on our first true vacations after we opened up, partnering with one of our fave color brands while on said vacation. No one got us there but us. Our hard work. Our eagerness to make our mark. That’s truly amazing. The biggest challenge to this day it still the illusion of life/work “balance.” Our Mom sustained a traumatic brain injury almost 6 years ago and has now entered Hospice. Not one small business owner with this life experience has been found to speak with, after years of searching. The hardest thing is dealing with a small business and attempting to stay sane while finding no advice anywhere on how to handle this situation. I would say that you should only attempt to start a business if you would do everything you know you have to (as well as handling many surprises) for absolutely no money. Passion prevails, and it takes time to see a return on your investment. You will eat, sleep, dream, cry, and sweat your business plan. Know it is never done. It is always evolving. If you are content never being comfortable, give it a shot. It’s all-consuming, but you’re not alone!